Institute return to league action this weekend when they face promotion chasing Bangor, at the Riverside Stadium (KO 3pm). Despite having a disappointing season a victory for the Waterside men would put them just six points behind the Seasiders having played two games less. That’s something assistant manager Paddy McLaughlin will be telling the Stute players this week at training. “The league table is a crazy situation,” he said. “People are saying Bangor are having such a great season, while some people are saying we are having such a disappointing season up until now, but if we get a couple of positive results within two or three games we would be level with them. “We know it’s a big game on Saturday, but if we manage to get three points and win our two games in hand we would be level with them in a matter of a few weeks. 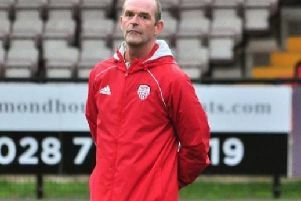 McLaughlin did admit everyone was bitterly disappointed after their Irish Cup exit, but he along with the entire squad have always put the league form as their number one priority. “The cups were always going to be a bonus for us, we spoke about it at the start of the season saying a cup run would be great for the club but our main focus was the league,” he added. “Look we want to start getting points on the board and start climbing up the table and that has always been our priority. “If you look at the league table there’s nothing really in it points wise, yes some people might be shocked when they see the position we are in but if you look at the point’s column we are only sitting five or six points behind the top four or five teams. Incredibly Stute’s last league outing was way back in November when they secured a deserved 2-0 win at title chasing Ards and McLaughlin wants a similar never say die attitude this weekend. “It’s important come Saturday that we are back doing what we were doing early in the season, where we were playing good football, scoring goals and everyone was working hard,” he added. Going into the game duo Ciaron Harkin and Garbhan Friel miss out through suspension and recent signing Niall Grace is also carrying over a suspension from his previous club Trojans, on the plus side Aaron Harkin returns from suspension and Darryl McDermott continues to step up his training following his recent surgery.